A week’s gone by since Valentine’s Day. How was yours? Maybe you felt showered with love, with cards from the kids, and flowers from your husband. Maybe you’re still secretly hurting that it was a day like any other, maybe worse than any other. You longed for a tender word, a treasured moment, a thoughtful gift. It did not happen. Or maybe it simply did not happen in the way that would have most touched your heart. Life passes by. Valentine’s Days come and go. Good ones and not-so-good ones. How can we be intentional in love all year round, not just on the special days? How can we cultivate love in our families, so that a ‘not-so-good’ Valentine’s Day doesn’t really matter (because actually it might be the next day that your husband tells you how beautiful you are, or the next week that your child gives you a special gift they made). And how can we, as wives and mums, be intentional in loving our husband and our kids? Now, I do love. A lot. Every day. I cook. I wash clothes (lots of them). I snuggle and play with my kids (and my husband). I listen. I encourage. I wipe tears. I cook and wash some more. I pour myself out in love. But, when was the last time I actively thought, ‘How can I show my husband how special he is to me this week?’ or ‘How can I love my child in a way that uniquely touches his heart today?’ and actually make a plan and put it into action? 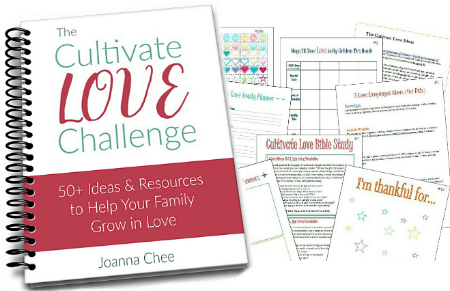 This post continues over at Literacy Musing Mondays, where I share some great resources and ideas to help us cultivate love in our families, and be intentional in love. Head on over to finish reading! There’s also opportunity for you to link up your own literacy and family related blog posts at the Literacy Musing Mondays Link-Up. A great chance to share your writing, or just discover some other neat blogs! Go take a look! Hi, thanks so much for your support. We are so glad you guest hosted with us this week. You’re welcome Mary. Thanks so much for having me!